Happy Friday and #ThatBusinessShow wraps up our 19th week on the airwaves on 1250WHNZ. Catch the show daily at 8am and please connect with me on Twitter at Jamie_meloni and catch all the show updates at http://www.tampabayradio.com and facebook.com/thatbusinessshow. 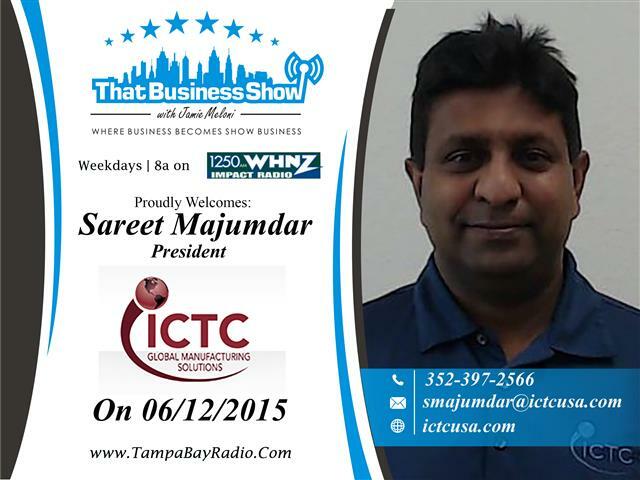 My first guest on the show today was Sareet Majumdar, President of ICTC Global Manufacturing Solutions. ICTC is a full service global manufacturing solutions provider specializing in low volume, high mix cable and wire harness assemblies, electronic box builds, PCB assemblies and turn-key services to OEM’s worldwide. Sareet was on the show to discuss some of the many differences in cultures abroad since his company takes him oversees several times each year. He frequently travels to Asia and is fluent in Mandarin and jokes on the show of the differences in what we in America consider Chinese food and what is true Chinese food oversees when he called a restaurant in the States requesting what they had on the menu that was authentic Chinese Food, only to be told by the staff member that he should not eat at their restaurant and that they only produced low quality Chinese food knockoffs for the American culture. Sareet touches on some of the differences in Asian cuisine and I was left feeling duped that I have never experienced then real Chinese Food by our American based restaurants. Sareet also touches on the Asian consumer’s buying habits and notes that credit cards are beginning to become more prevalent in the Country and we will likely see a strong increase in Asian demand once their cultures accepts credit cards more. Sareet and I also touched on a couple of revolutionary products that he and ICTC are involved in including a device designed to catch those that speed past school buses that are stopped and a product that repels mosquitoes and other nuisance pests/animals by using your sprinkler system. Learn more about Sareet and his company at http://www.ictsusa.com and he can be reached at 352-397-2566 or email at smajumdar@ictcusa.com for more information! 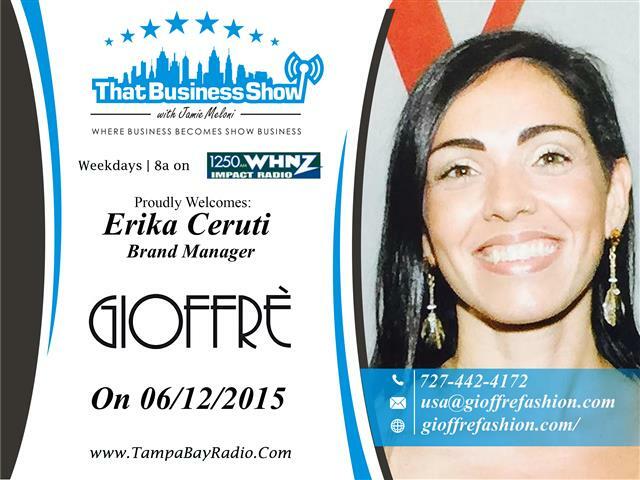 On the 2nd half of the show, we continued the International / Global Trade them as guest Erika Ceruti, brand manager of Gioffre Fashions joined the show. Founded by her mother, Gioffre Fashions is an Italian based fashion line that has stores abroad as well as in Tampa. Erika speaks of the influence of her mother on the opening segment and how her love of fashion carried over to her at a young age. Today, the company which is located at 8th South Fort Harrison St in Clearwater, offers a wide array of Italian fashions and can work with customers on tailor made clothing, bespoke (made to order) and elegant gowns for galas and events. They’ve recently launched a new men’s clothing line as well and Erika touches on the upcoming fashion show that will feature Gioffre Fashion’s on September 10th at the Villa Bellini Restaurant. This event is by invitation only too so if you want an invitation, email her at usa@gioffrefashion.com and request. In the last segment, Erika discusses her past as a singer and songwriter and her love for all things music. Inspired to sing by her father who was a drummer, Erika sings all types of music from opera to hard rock music. Since the birth of her daughter though, her focus is now on the fashion industry and business Gioffre Fashions. Be sure to visit their website at http://www.gioffrefashions.com for more information on their story and products and they can be reached via phone at 727-442-4172!